Yesterday I ordered spring seeds and plants for my garden. I AM SO EXCITED! This year, I expect major things form my garden. The spring seeds and plants I ordered include tomatoes, potatoes, onions, peppers, herbs, eggplants, beans of all sorts, tomatoes of all sorts, marigolds, lots of corn, peas…so many things I can’t wait to eat, can, cook, and turn into yummy, yummy stuff! Receive colorful seed catalogs in mail. Ooh and ahh over colorful seed catalogs. Decide I’m spending too much money. Realize I’ve waited too long to order, everything I want is sold out. Rush to local nursery and end up spending way more money on whatever grab bag assortment of plants is left. 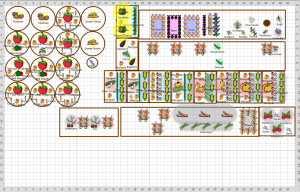 As a result, for years my garden has been small and under-planned. I haven’t done enough to prepare the soil for plants, because everything’s done in a rush and I don’t know what to prepare for. I haven’t really planned out a garden, because I didn’t know what I’d end up with. And the yield has been…well, unimpressive, to say the least. It’s a New Year! I Ordered Spring Seeds! Some of those longer gardens in the plan are our pre-existing landscaping that wraps around our house. The round containers are large pots, and then we have a bunch of rectangular tubs that we use as container gardens. If you look really closely, you can see garlic growing in the back behind the irises. And that blank canvas where those little ceramic mushrooms are? That’s now filled with lavender, parsley, tarragon, oregano, thyme, and to the right, sage. Slowly, over the course of the last five years, I’ve been replacing plants with edible landscaping. I’ve added elderberry, asparagus, rhubarb, raspberries, horseradish, and tons of herbs. This year, when I ordered my spring seeds, I also decided that I’m adding wasabi and blackberries, plus a few more herbs. Most vegetables are planted in containers each year although I use some of the landscaping beds for things like onions, beets, and garlic. I’ve been contemplating which other perennials to add in my landscaped gardens by my house. Several years ago, one of these beds was completely torn up by the installation of a connection to the city sewer system. It’s across from the garden I’ve shown you here with the garlic planted in it (this year, that garlic is being moved to the raspberry patch, because I read they grow nicely together). I refuse to show you a picture of the bed in question because it’s just that horrible-looking. I’m embarrassed by it. If you look in the garden plan, the “trouble spot” is the one on the right-hand side with the two blue/green plants in the middle (horseradish and wasabi). As a result, that garden typically ends its summer season filled with lillies, phlox (which I love), and weeds (which I hate). The entire garden really needs an overhaul. With a few changes, this garden could become really productive and useful. 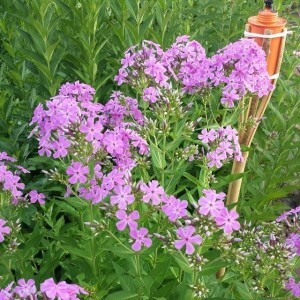 Who could call phlox a weed? IT’S GORGEOUS! The problem is, to accomplish that goal, I think I may have to get rid of all the daylilies and phlox, and I really do love the phlox. And our phlox is unbelievable. The blossoms are huge and when it rains, they get heavy and can’t hold their heads up. They’re also a variety of colors – lavender, pink, white – and sometimes I just sit outside looking at them. Bumble bees love them – I’m not sure if that’s good or bad. But I love them mightily. My husband, not so much. I don’t know why. Point is, if I’m to use this garden to its fullest potential and reduce the weed population, I’m going to have to do something different. I just don’t quite know what yet. Maybe I can get rid of the daylilies, which are not my favorite, and plant a ton of corn in this space. Maybe eventually the horseradish and wasabi will take over the entire garden. Maybe, maybe, maybe. 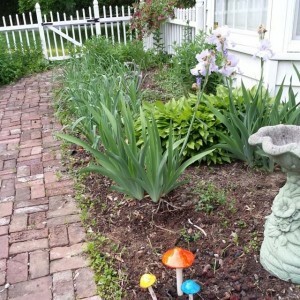 All I know is that something different has to happen with this garden this year – it’s an eyesore to me every year, and each year I vow to address it. This is that year. I’m so excited to have taken action and to know that I’m going to have an amazing garden this year. Squee! Of course, now that I’ve ordered my spring seeds and plants, it’s very “hurry up and wait,” but there’s a lot to do to prepare the soil and get the gardens ready, so I really need to make that plan now. Have I mentioned? SQUEE!